Contact Nicole Gerbino, Area Leader for LoveActs. Our tutoring and homework help group meets weekly at Walker Elementary to help kids with homework and studying. The requirements are simple – enjoy working with children and helping them with study skills, basic homework, or mentorship. Come check out our tutoring program on Wednesdays from 2:15pm -3:15pm from September – June. You can serve once a month or more - a simple volunteer clearance through the school is required. CCC provides two tons of free food once per month to local families in need through our Food Distribution ministry. On the first Thursday of the month from 3:00pm - 5:00pm from September – June. we distribute the food at Walker Elementary School, located in Mira Mesa. Any family who could use some help meeting their grocery needs is welcome to come out and receive food. Volunteers from the community can serve from 2:30pm - 5:00pm, helping to sort and distribute the food. It is a great way to help in our local community. We have had clubs, employer groups, and local organizations help in the past – it is a wonderful opportunity to serve together as a team or meet some new friends. Donate gift cards from grocery stores to this ministry. Prepare and donate meals at 5:00pm on scheduled dates. 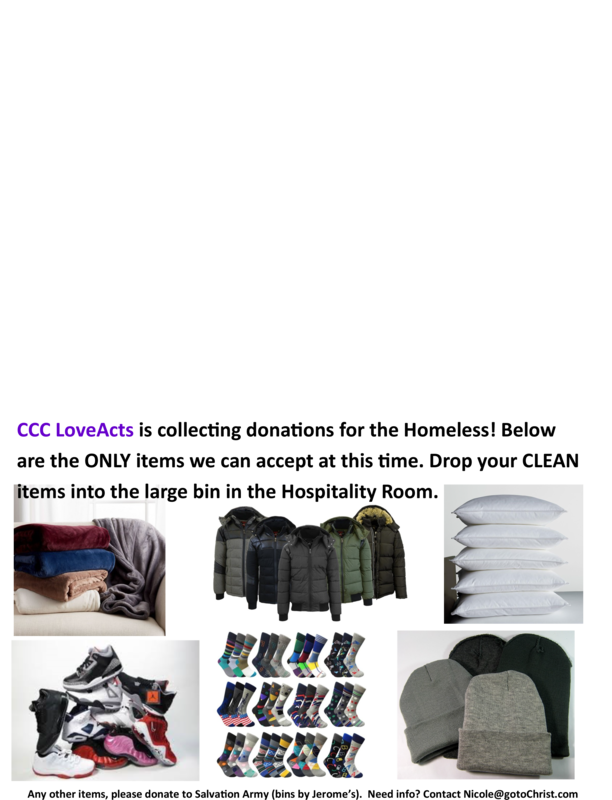 Keep an eye in the CCC bulletin to find out what we is needed. Things you can donate every month include soft fruits such as bananas, cookies, granola bars, and other non-perishable snacks, cases of bottled water. Join the distribution team as we head downtown to hand out the collection items and meals. Save your bottles and cans and bring them once each month on the scheduled date. All proceeds benefit LoveActs ministries, including meals and supplies. CCC partners with churches throughout Mira Mesa, including Grace Chapel, Canvas Church, Summit Point, and Redemption Church, to provide backpacks filled with school supplies for kids across Mira Mesa whose families need a little extra help around the start of school. "All items should be clean when donated"
All items are distributed by the church directly to needy families and homeless people throughout the city of San Diego. Annually the church fills shoeboxes with gifts for children in poverty stricken nations so they can experience the love of Christ, hear the Gospel and celebrate Christmas. This campaign takes place in October each year so watch your bulletins for more information. Watch for sales and begin preparing your boxes ahead of time. The helping hands ministry provides comfort and support to the hurting members of our congregation, as well as those in need. This comfort and support presents itself in a variety of different ways including but not limited to delivering meals to someone recovering from an illness or hospital stay or person grieving the loss of a loved one, visiting CCC family members in the hospital, rehabilitation facility or at home during their recovery/shut-in, helping the elderly with errands or around the house tasks, and many more.